Acrovyn barrier-resistant doors feature a small compact door within the main door. 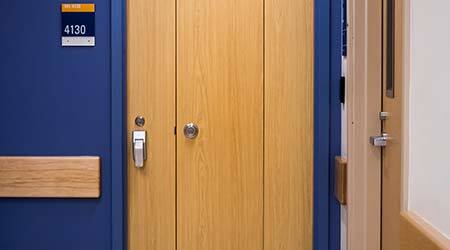 The smaller, compact door provides staff access to a room if a barricade is used by a patient. Fire-rated up to 20 minutes, this model is durable, easy to clean, and available in solid colors and Chameleon wood and metal patterns, as well as Acrovyn by Design textile looks. The outer leaf features field-replaceable stiles and edges to extend the life of the door.